Development of an intranet solution from Confluence-Basis for around 3,500 users. Meyer Werft GmbH & Co. KG is a German ship building company that is known for it’s large shipyard in Papenburg (located in the county of Emsland). In 1795, MEYER WERFT took up business for the first time in Papenburg. For over 200 years, a variety of ships have been built by the experts and specialists of the family business. In order to be able to compete internationally with other shipyards, production technology had to constantly be expanded. Thus, MEYER WERFT shipyard now has the world’s most modern ship building facilities. The goal was to offer a single intranet solution to various different locations with different languages and to customize the solution for the individual user. Additionally, a channel to share corporate news easily and user friendly was to be created. The project “On Board” has the goal to set up Confluence, Jira, and Sharepoint as a platform for digital collaboration. 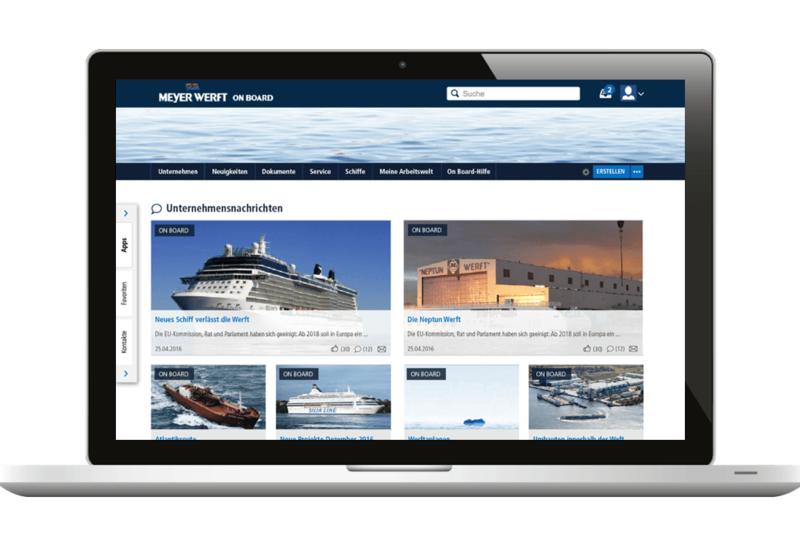 The intranet project represents communication, information and services and is the foundation for project “On Board” as well as it’s technological extension. A quality management based on Confluence is being created. Additionally, various processes are to be supported with Jira.